NAIROBI, Kenya (CNN) -- A Kenyan judge Thursday sentenced one of the country's most famous white aristocrats to eight months in prison for fatally shooting a suspected poacher on his family estate. The case of Thomas Cholmondeley, 40, has highlighted the country's fractious relationship with its British colonial past. Cholmondeley is white and his victim was black. Justice Muga Apondi said he did not take race, color, wealth or status into account in deciding the sentence for Cholmondeley, who was convicted of manslaughter. "There should be no suggestion that there is one law for the rich and one law for the poor," Apondi said. In deciding what he described as a "light sentence," Apondi noted the 1,097 days that Cholmondeley has already served behind bars. "I do believe deeply that the process has humbled the accused person," the judge said. "This court has taken into consideration that the accused has been held in custody for slightly over three years since he was arrested." 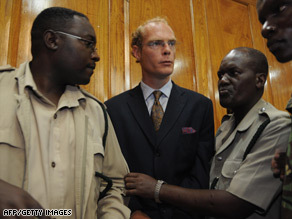 Cholmondeley was charged with shooting Robert Njoya, a stonemason, in May 2006. Njoya was on Cholmondeley's expansive Rift valley ranch and wildlife sanctuary with two others and a pack of dogs. "The accused did not have any malice aforethought in killing the deceased," Apondi said. "Put in simple language, the killing was not premeditated, as the accused never had any grudge whatsoever against the deceased." He added that the defendant tried to render first aid to Njoya after the shooting, rushed him to the hospital and used his credit card to pay for treatment. The defense had told the judge that if he showed leniency, Cholmondeley's family would meet the financial needs of Njoya's widow, but the judge did not comment on that when reading out the sentence. The judge said he considered Cholmondeley a first offender and took that into consideration in sentencing. But fueling public anger was another incident in which Cholmondeley was accused of shooting a game ranger who was out of uniform. That case was dropped because of a lack of evidence.